Americans curse more and more--especially on reality-show TV. Profanity has become so commonplace on television that the producers of Duck Dynasty actually add gratuitous bleeps for the Robertson family's dialog, because the Robertsons--evangelical Christians from central Louisiana--don't curse. So we shouldn't be too shocked to learn that Assistant Secretary of State Victoria Nuland said "F--- the EU" in a leaked conversation with the United States Ambassador to the Ukraine, Geoffrey Pyatt. What's most embarrassing, of course, is that the United States government and the New York Times have been lecturing Russia about meddling in the Ukraine, but the leaked phone call shows that it is the U.S. that turns out to be the biggest meddler. 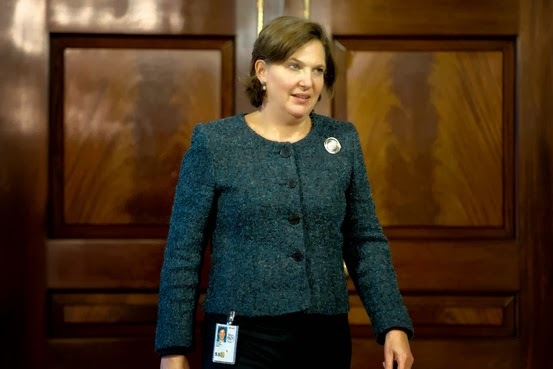 And where did Ms. Nuland attend college? Brown University. Yes, Ms. Nuland is another one of Barack Obama's people who was educated at an Ivy League college. Apparently, these schools do not teach civility and diplomacy; they just teach people to be scornful and arrogant. Thus we have Secretary of State John Kerry, a Yale man, who insults the Syrians at the peace talks on the Syrian uprising by basically telling the Assad regime up front that it has to go. He behaves so arrogantly to the Israelis that the Israeli Defense Minister accused him of having a messiah complex. And Barack Obama himself is so contemptuous of the American people that he lies to them repeatedly without bothering to even make a decent apology. I've said it before, and I'll say it again. All three branches of our government--but the Executive Branch and the Judicial Branch in particular--are stuffed with people who achieved degrees from elite universities who do not know how to behave decently. They do not have the simple dignity, grace and character that most Louisiana crawfish harvesters innately possess. Michael R. Gordon & Jodi Rudoren. Israeli Official's Reported Criticisms of Kerry and Peace Effort Draws U.S. Rebuke. New York Times, January 15, 2014, p. A8. Andrew Higgins & Peter Baker. Russia Claims U.S. Meddling Over Ukraine. New York Times, February 7, 2013, p. A1. Michelle Obama and Secretary of Education Arne Duncan were in Alexandria, Virginia earlier this week urging students to fill out federal financial-aid forms to attend college. "Fill out those forms, fill them out!" Michelle urged students as she watched them fill out the forms. "Don't leave money on the table." Fill out those forms, fill them out! I don't mean to be hard of Ms. Obama. I commend her for urging high school students to attend college. And I realize most low-income students need to borrow money in order to pursue the dream of a college education. And the forms are complicated to fill out, although the Department of Education is trying to make them simpler. Nevertheless, it is reckless and irresponsible to urge poor families to borrow money to attend college unless that advice includes some warnings about the trouble poor kids can get into when they take out college loans. 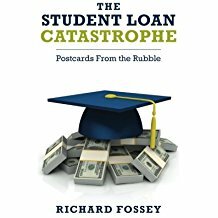 First of all, the federal student loan program has created a giant morass of debt that has sucked many people into a lifetime of penury. People who attend for-profit colleges are especially vulnerable. According to DOE's own data, one out of five students who take out loans to attend for-profit institutions default within three years of beginning repayment. And, as I have said before, the true default rate is probably double that. And research shows that low-income and minority kids are most likely to be snagged by the rapacious for-profit college industry. Is it irresponsible for the First Lady to urge students to take out student loans without warning them about the for-profit colleges? Yes, it is. Second, millions of people with college degrees hold jobs that don't require a college education, and millions more have made poor borrowing decisions--borrowing money to get an expensive degree in art education, for example, that will never open the door to a high paying job. Consequently, lots of people have defaulted on their loans or have gotten economic hardship deferments. According to the Consumer Financial Protection Bureau, a federal agency, 15 million people have either defaulted on their loans or have stopped making payments because they are under some sort of economic hardship deferment or other forbearance program. Among the people who are making loan payments, quite a few are making payments that don't cover accruing interest, which means their debt is growing larger over time, even though they make their loan payments every month. 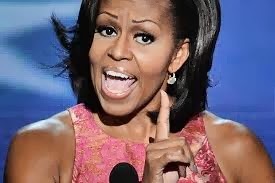 Is it irresponsible for Michelle Obama to encourage young people to borrow money to attend college without warning them of the consequences of making poor choices in terms of a college major or the cost of tuition at the college they choose? Again, the answer is yes. Meanwhile, Arne Duncan's Department of Education is frantically urging student-loan borrowers to sign up for income-based repayment plans that lower monthly payments but stretch out the loan repayment period to 20 or even 25 years. In my opinion, DOE is setting up America's young people to become a class of indentured servants--forced to turn over a portion of their paychecks to student-loan creditors over the majority of their working lives. Let's face it: Barack Obama, Michelle Obama, and Arne Duncan are in a frenzied effort to preserve the status quo for the higher-education industry--a bloated, self-satisfied, increasingly isolated and irrelevant bunch of institutions led by overpaid blow-hard presidents. Millions of people have fallen into the student-loan trap. Financially stressed debtors can't take bankruptcy to discharge their loans. They don't have access to consumer protection laws. Those who are ripped off by the for-profit colleges can't sue because the for-profits force students to sign agreements promising not to sue as a condition of taking classes. Michelle may think her life story is an inspiration for aspiring young people who are living in poverty. But the chance that these kids will go to Princeton and Harvard Law School like Michelle did is about as good as getting a lucrative contract to play for the Pittsburgh Steelers. If Barack, Michelle and Arne want to start behaving responsibly, they should work to kick the for-profit colleges out of the federal student loan program. They should work to amend the Bankruptcy Code to allow insolvent student-loan debtors to discharge their loans in bankruptcy. They should publicize the true student-loan default rate--which is probably double what DOE reports every year. But Barack, Michelle, and Arne won't do that. The higher-education industry's lobbyists and campaign contributions make sure no serious reforms will ever take place. And millions of low-income and minority young people are seeing their financial futures destroyed, not enhanced, by the federal student loan program. Emmarie Huetteman. First Lady Urges Students to Apply for College Aid. New York Times, February 6, 2014, p. A15.